In recent years, Philippe Petit has swapped his record label owner’s hat for that of performer, apparently putting the excellent Bip-Hop on an indefinite hiatus while he focuses on his own music projects. First, there was Strings Of Consciousness, a loose collective which counts over twenty musicians, with whom he has released three albums, including one with Angel, the trio of Pan Sonic’s Ilpo Väisänen, SchneiderTM’s Dirk Dresselhaus, and cellist Hildur Guðnadóttir, then came his solo releases (Henry: The Iron Man and his reworking of Gustav Mahler’s Titan symphony, Off To Titan), his ever expanding circle of friends, the franchise counting so many luminaries per album (four to date), some sticking around for a few tracks, others just dropping in for a moment, that it is virtually impossible to account for them all, and, last but not least, the full length collaborations, with James Johnston (Friends With A Face), Pietro Riparbelli (The Haunting Tryptich), Lydia Lunch (Twist Of Fate), and the odd isolated effort (the Mist While Sleeping 7” with Cosey Fanni Tutti released last year). The latest in this series of collaborative albums was recorded with Greek experimental outfit Chapter 24 over two years ago. Petit joined the trio of Antonis Livieratos and brothers Vangelis and Periklis Boulouhtsis for a live improvised performance at Athens’ art centre BIOS in 2008 as both acts celebrated twenty five years of music activism. The performance was captured on the night and consequently served as the starting point for this vastly diverse and engaging record. Feeding on a shared interest in film soundtracks, The Red Giant Meets The White Dwarf unfolds through sweeping textured atmospheric soundscapes cast in dense layers of processed guitars, keyboards, electronics and field recordings. But, unlike some of Petit’s previous collaborations, the mood here fluctuates greatly, from dark and oppressive (Sunstroke, Border Zone) or deeply haunting (Underwater Magma, Phosphorescence), to mechanical and abrasive (Treasure Hunt) and oddly disconcerting and ethereal (Dust Mites, Ursa Minor), flowing from one state to the next almost imperceptibly. To what extend the original recordings have been processed and layered with additional components, or preserved intact, remains unclear throughout, but the tension that is applied here undoubtedly owes to the live improvisation. 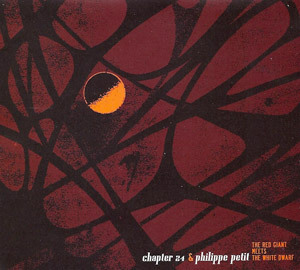 While Chapter 24 have been performing for over a quarter of a century with the exact same line up, they appear to integrate Petit’s contribution with great ease. Equally, Petit feels right at home with the trio, adding delicate textures and brushes, at times stepping back when his intervention requires it, at others moving forward to lead the way. What the quartet manage here is quite impressive. While the mood constantly changes, they manage to retain the same level of intensity all the way through to create a particularly evocative soundtrack of their own.